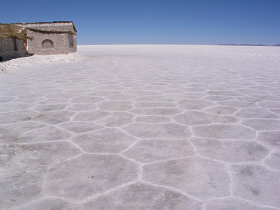 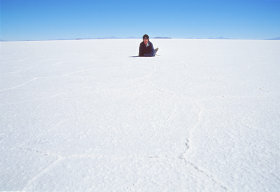 Where is the world's largest salt flat? The biggest salt desert of the world is located in Bolivia, near the town of Uyuni, at an altitude of approximately 3800 meters above sea level. 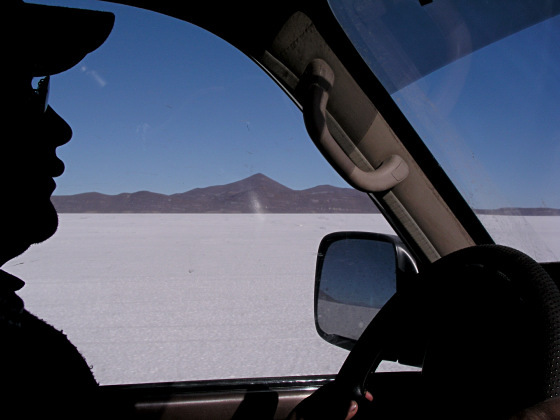 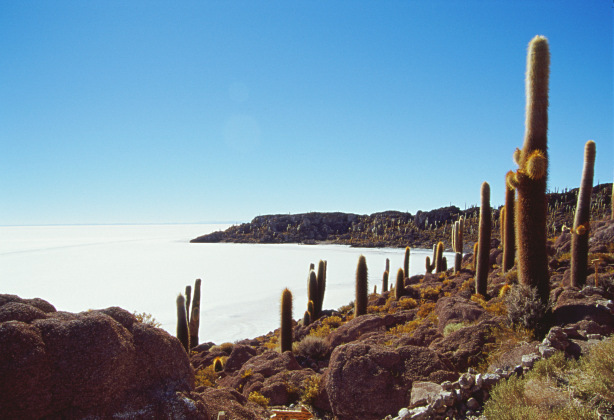 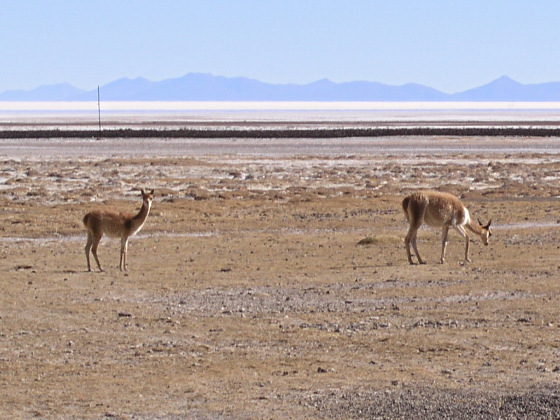 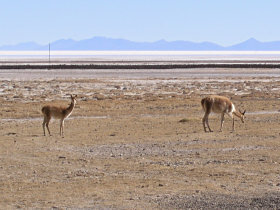 A tour to Uyuni Salt Flats by 4x4 lets to discover an incredible geological wonder, that hosts also a population of giant cactus over an island emerging from the salt desert. 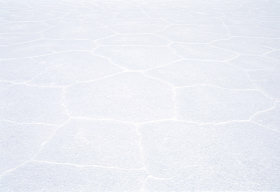 Photos of Uyuni Salt Flats. 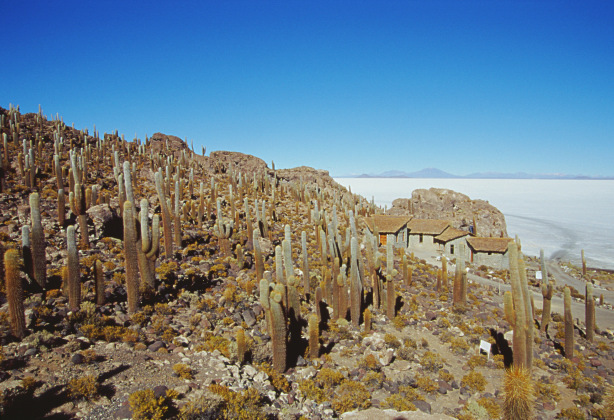 The excursion to the salt flat begins with a one hour driving to Fish Island, a small hill in the middle of the salt flat, populated with giant cacti. 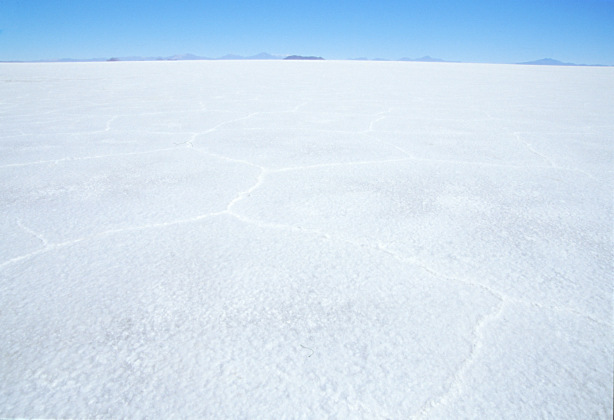 The Salar de Uyuni is the world's most extended salt flat and is located at an altitude of approximately 3800 meters. 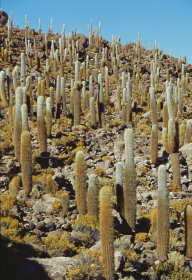 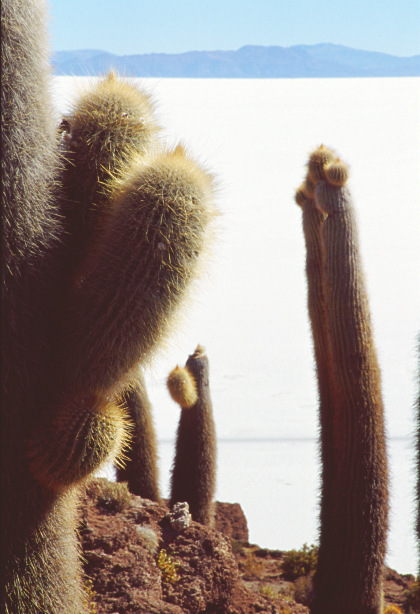 Pictures of giant cacti, probably Trichocereus, populate this small hill made of "fertile" soil. The hill is like a garden, densly populated by wonderful cacti, up to 10 meters tall (more than one hundred of years are required to reach that size). 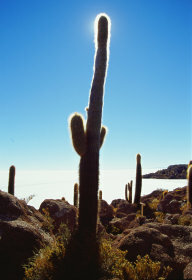 Following a marked trail, I start to walk up to the hill's top. Beautiful, giant cactus are everywhere. 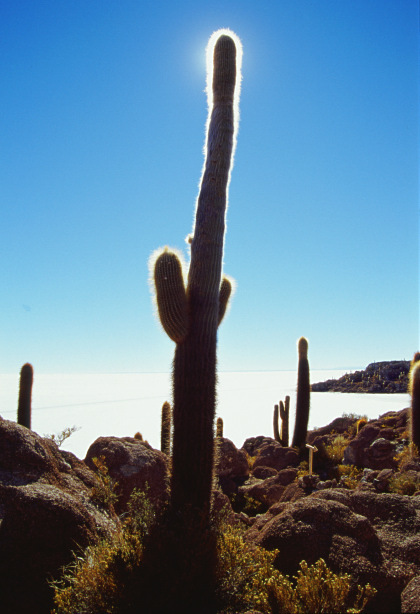 On the left picture: the sun illuminates a cactusfrom behind. 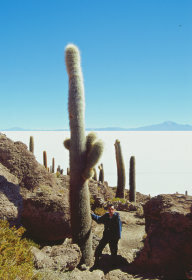 On the right picture: me under a nice cactus. 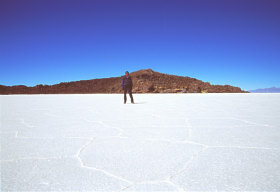 Salar de Uyuni photos. 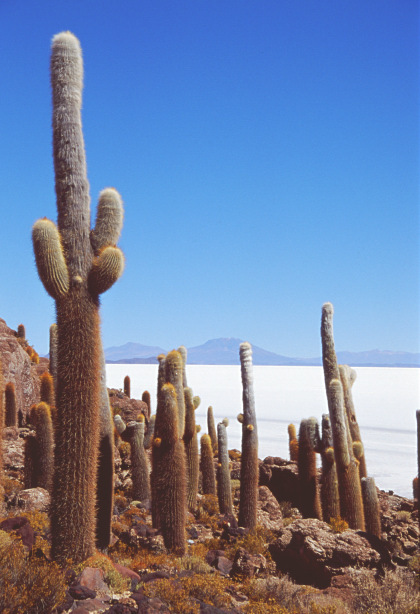 Giant cacti make a nice contrast with the bright salt all around. 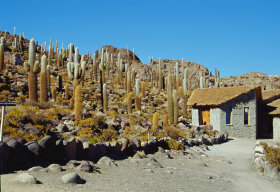 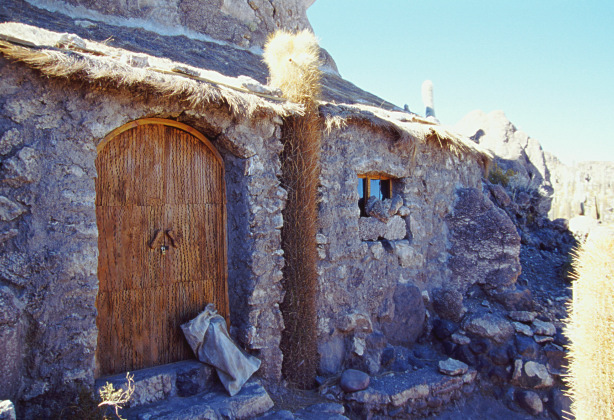 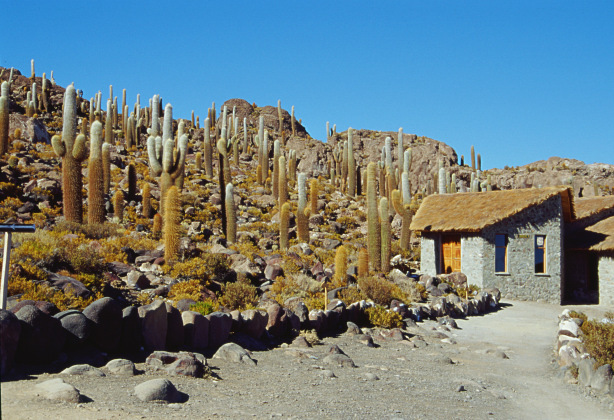 Buildings, made of stone and cactus wood. 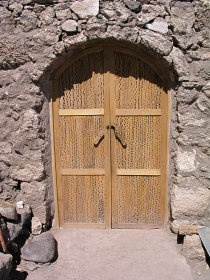 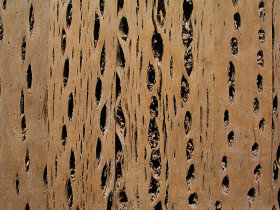 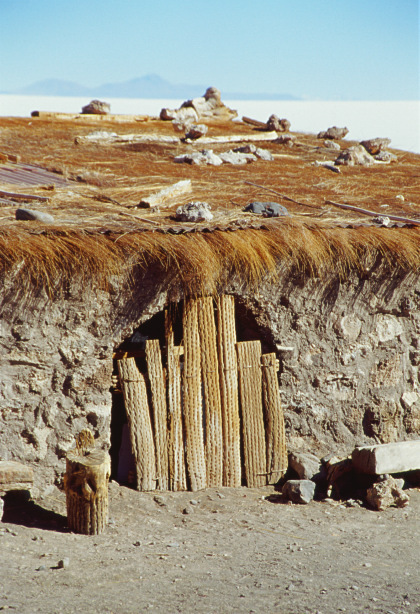 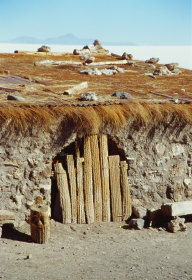 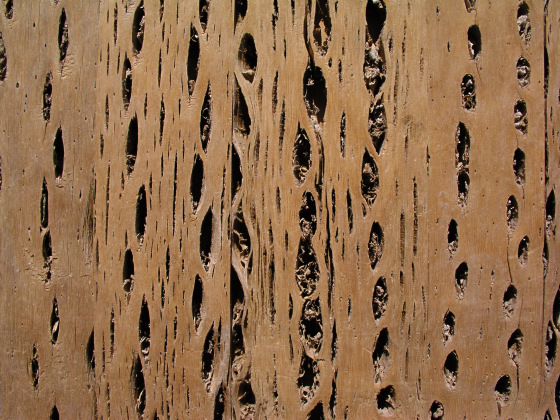 A door made of cactus wood. 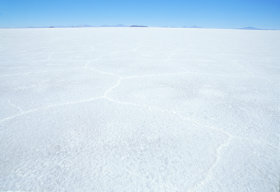 Panoramic photo of Uyuni salt flat. 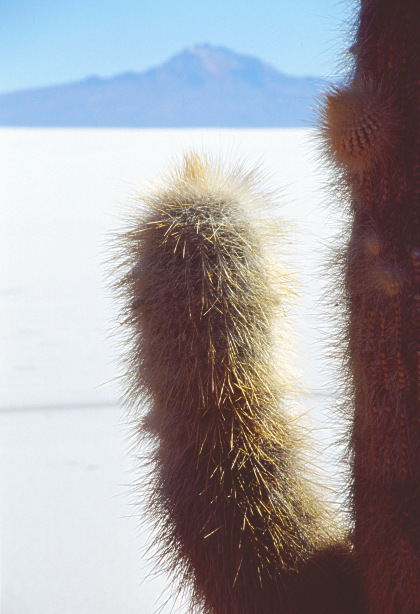 In any direction, this is exactly what I saw. 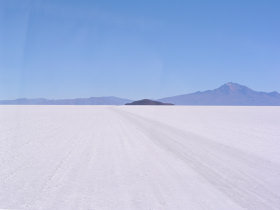 Left picture: me over the salt flat. 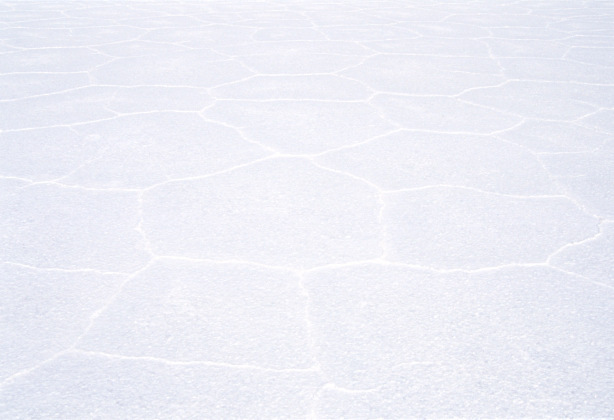 On the right, the beautiful pattern over the salt. 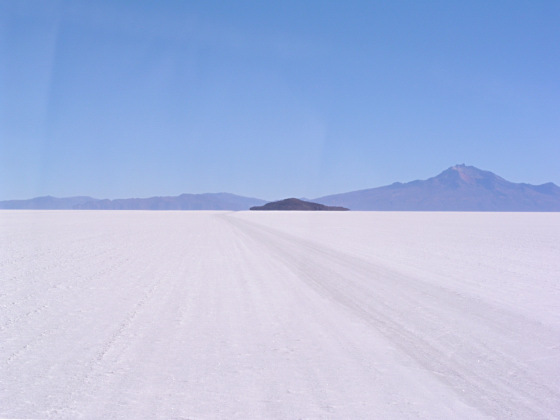 Upper picture: the salt flat extends to the horizon, up to the mountains in the background.Lower picture: me rolling on the salt. We take the highway again to our today destination of Uyuni. Occasionally we see some jeep going in the opposite direction. After about 70 kilometres, we arrive at the salt hotel, a building made entirely of salt. 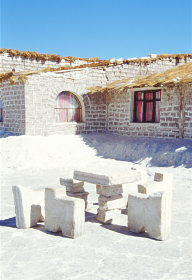 Also the table and the chairs are made of salt. 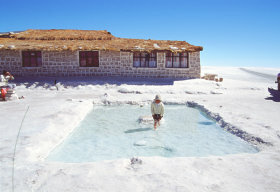 A child is having a small bath in the cold waters of a swimming pool. 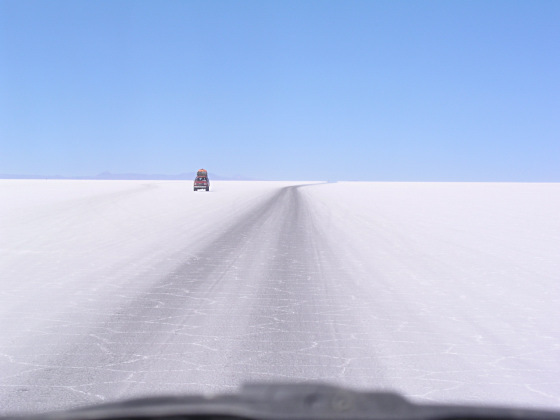 We are approaching the opposite shore of the salt flat. 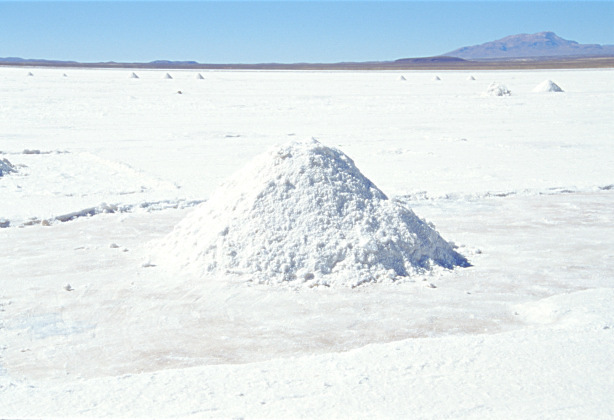 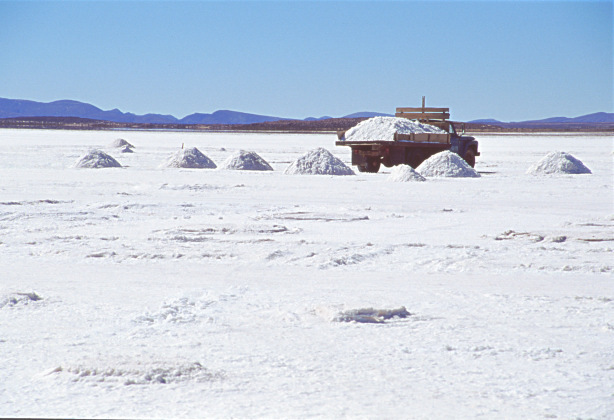 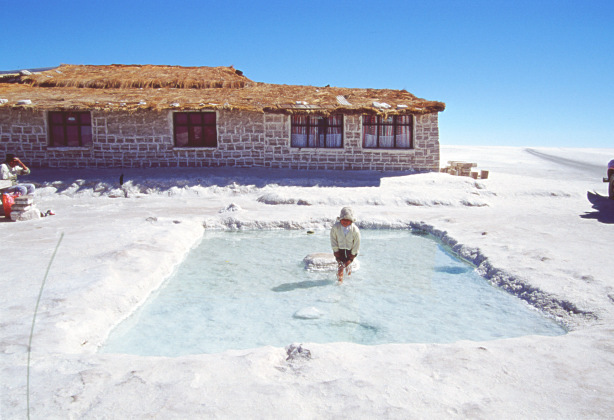 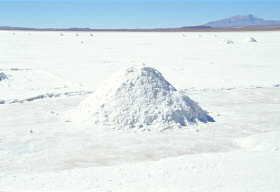 Here the salt is collected and processed in the nearby village of Uyuni. 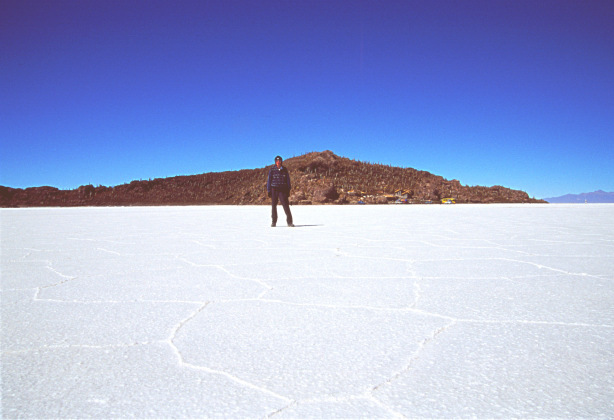 Back on the ground... we see a small group of vigugnas. 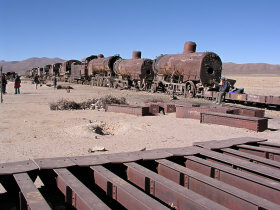 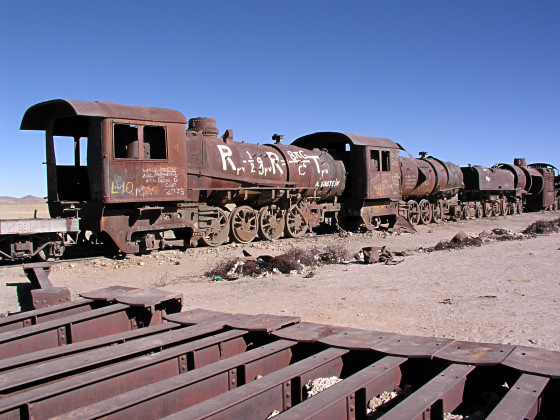 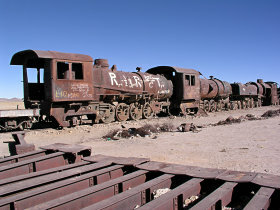 The afternoon continues with a visit to the train cemetery of Uyuni where a lot of old machines are resting here. 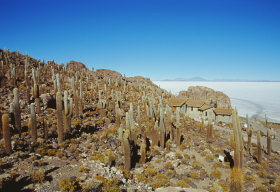 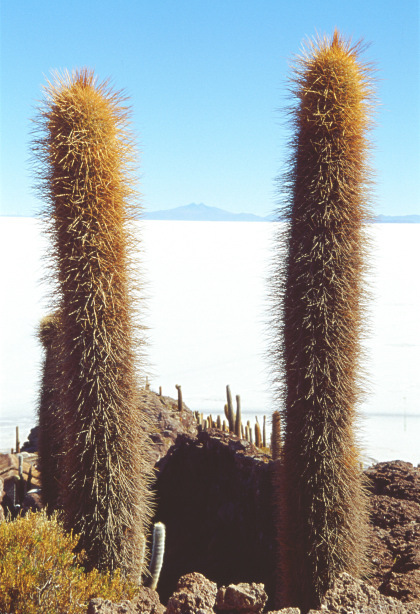 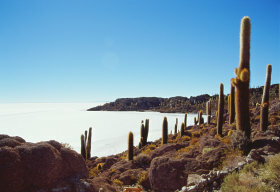 Pictures of Uyuni. 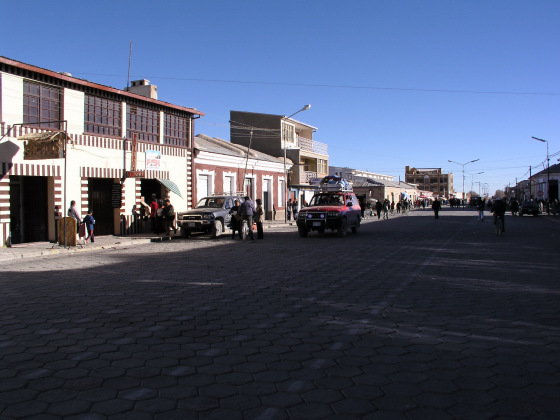 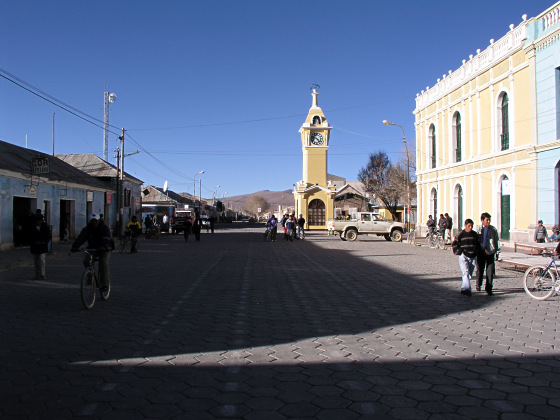 It's almost evening when we reach Uyuni's main street. 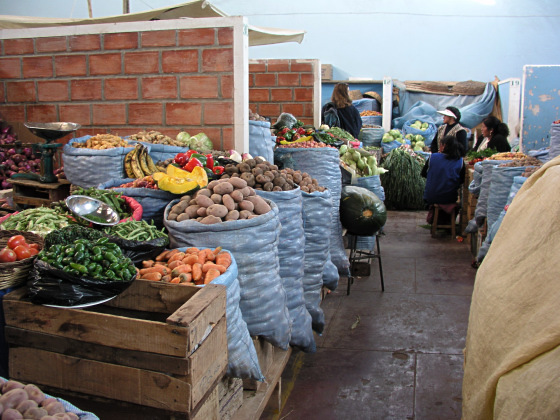 The day finishes with a visit in the Uyuni's public market where fruits, vegetables and spices of many colors and many fragrances, are sold by the locals.